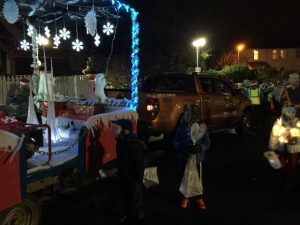 Delighted children enjoyed a yuletide evening and Northern Supercar Hire enjoyed pulling Santa’s sleigh through the streets of West Kilbride. The reindeers were also delighted as they managed to rest before the big night. The beautiful crisp, clear weather and the appearance of Christmas lights and trees all over the country is making us feel very festive! If you are looking for a Christmas gift for a Supercar lover, a festive gift certificate could give them an experience to remember and a gift to bring joy for many months. Gift Certificates can be organised for a 24 hour hire, weekend hire, or simply for a specified amount to put towards Supercar hire of the recipients choice. What could be better than the gift of driving their dream car in the New Year? Like Santa’s sleigh, the Supercar can be delivered and collected at dates and times to suit you. Call now for further information.